Mother’s Day is so happy. Flowers are being given, cards passed out and beautiful dinners are being prepared. For some this holiday is the holy grail of all holidays but to a few this holiday comes with complete sadness and pain. Let me say first of all if you have lost your mother my condolences to you. 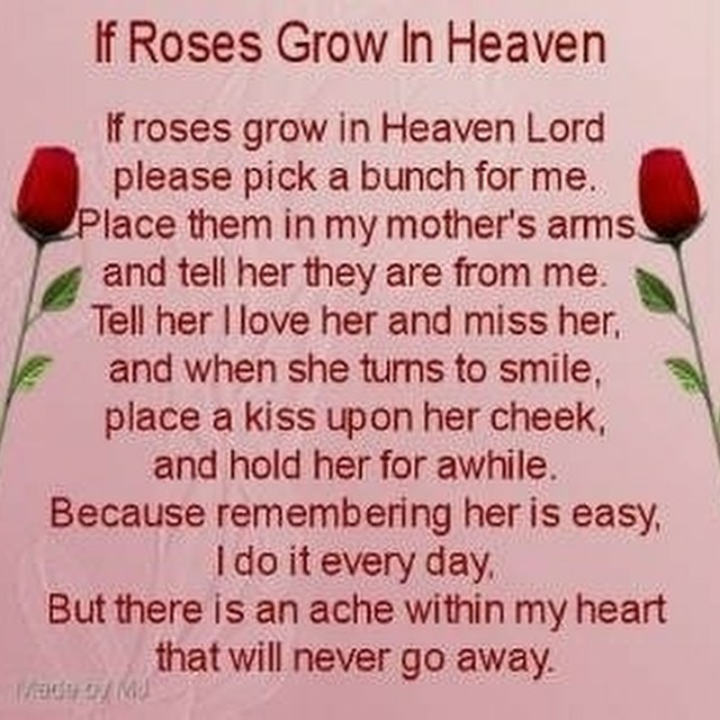 It doesn’t matter if it’s been years or just yesterday, the loss of a mother is major. Moms have stamped our hearts in ways no other human on this planet will. Mother’s Day again when you have lost your mother is a hard day. Some people experience a level of depression and grief that is above anything they have every had to deal with. If this is you let me say it’s okay. You are allowed to still grieve. You are allowed to be sad. You don’t have to hold those feelings in. Don’t let anyone make you feel guilty. Even if your mother left an outstanding legacy, that won’t erase the pain of wanting to hold your mother’s hand or hear your mother’s voice. I do suggest doing something in your mother’s memory when you’re ready that will be tangible. It can be planting a tree in her honor to naming a star after her. Just allow it to be something that you have here on earth to help you process your feelings. My other suggestion is to team up with a counselor that specializes in or with grief. It’s challenging in trying to navigate the hole in your heart. Even the most strong man or woman will have issues with the loss of their mother. There’s absolutely nothing wrong if you find that you aren’t able to perform daily tasks due to your grief. Although you will never be able to replace your mother, attempt to find a woman figure that represents some sort of peace to you. We all need a mother’s love. I mentally hold my hand in yours as again nothing beats your mother. As Mother’s Day approaches know that whatever you’re feeling, it’s normal and healthy. I pray your strength to get past this moment. I pray that you can smile even if you must cry. Your mother is watching over you and your angel loves you. For my readers who still have your mother, even if the relationship is rocky reach out to her if you can and tell them you love them. Whatever issues that are present can be worked out even if it’s understood that you need to have space between the two. Space is better for an open door than for death to permanently separate. Be gentle with your loved ones whose mom has transitioned. Understand them. Call a loved one or friend on this day and check on them.